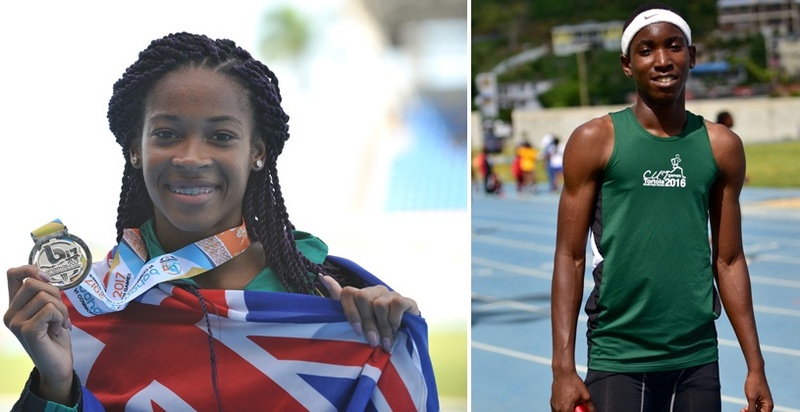 Beyonce Defrietas and Jaleel Croal (pictured above) are two of the best track and field athletes in the British Virgin Islands and are set to showcase their talents at the 2018 Flo Golden South Classic. While Hurricane Irma destroyed their training facility on Tortola in September and they didn't have their annual high school championships in March, it didn't damper the enthusiasm of the British Virgin Islands' young group of athletes who persevered to compete in the Carifta Games in the Bahamas in April and will be returning to the Golden South. Akrissa Eristhee is a 2018 Carifta Games 400m finalist, after running a personal best of 55.74 to advance to the final, where she was eight in 57.67. She failed to make the final of the 400m dash at Golden South last year despite running an impressive 58.39 for a 7th grader, the same event she will run again at the 2018 Flo Golden South Classic. While she was injured in the 100m this year, Beyonce DeFreitas is a four time Carifta Games finalist and last July, won the BVI's first track medal in the Commonwealth Youth Games, when she earned 200m silver. Defrietas was 8th in the 400m final last year with a time of 56.64. She is entered in the 200m dash at the 2018 Flo Golden South Classic. After having the best showing among males in the NACAC Age Group Championships in the 13-14 Boys Division, Jaleel Croal, 15, is having a break out year. Croal became just the third BVI athlete advancing to a Carifta Games 100m meter sprint final in his 2018 debut, in the territory's 43-year history. He finished sixth in the final in 11.05 seconds, after an 11.02 (+2.4) semi. He has a best of 10.89 seconds and has run 21.98 in the 200m. The Fast Lane Track Club out of BVI will also be returning to this year's event and we can't wait to have both teams in attendance! Think you have what it takes to take down the best from BVI and the rest of the field? Want to make your mark on Golden South History?